Wootton's John Riker was inches away from winning the first invitational of his career, but a hard-charging Nate Neely from North Hagerstown High School denied Riker the win when he sprinted into the lead at the last possible moment. Riker was not altogether disappointed by the outcome. Riker trailed two runners from North Hagerstown for the first mile before taking over the lead at about the one mile mark. He relinquished the lead at around the 1.5 mile mark and trailed for nearly the entire second half of the race. Said Riker, "In the past couple meets, that's kind of gotten me when I'm in the lead and guys have passed me, but I just hung behind them." "By the place where the big hill is [approximately 2.75 miles], I just felt like I could take the lead and put those guys away...so I used that hill coming down to build momentum and to pad that lead because they are more of short distance guys. From there to the finish, I just went all out. I felt pretty confident and then the last ten meters, I see him cut ahead, but I'm very happy with the performance." Riker was out-leaned, officially 16:39.6 to 16:40.0, but in reality it was a judge's call. Perhaps losing in that fashion will add fuel to the fire while Riker waits two weeks for his next race. Riker added, "Physically, it felt good, but mentally, I feel like I am ready going into counties." It was Wootton High School's final tune-up meet before the Montgomery County Championship Meet in two weeks. Coach Kellie Redmond is looking forward to two weeks of hard workouts between now and then. She was happy to use the team's final tune-up meet on a low key preview of the 4A West Regional Meet at Watkins Mill High School. 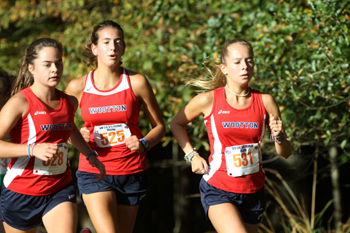 The outcome of that tune-up was a narrow victory for the Wootton girls and a second place finish for the Wootton boys. Redmond was not as concerned about the team standings as she was about the way that her runners raced together. Said Redmond, "Now that the bulk of our racing is done...we've really been focusing on trying to pack them up a little bit more and close the gap from our first to the rest of the pack. They've shown a lot of signs of improvement on that so it was nice to see them put it into play today." Third place Jessica Trzeciak still finished 48 seconds ahead of her next teammate, but Emma Henderson, Alyssa D'Arpa, Adna Trakic, and Erin Chelf finished consecutively between 20:55 and 21:15. 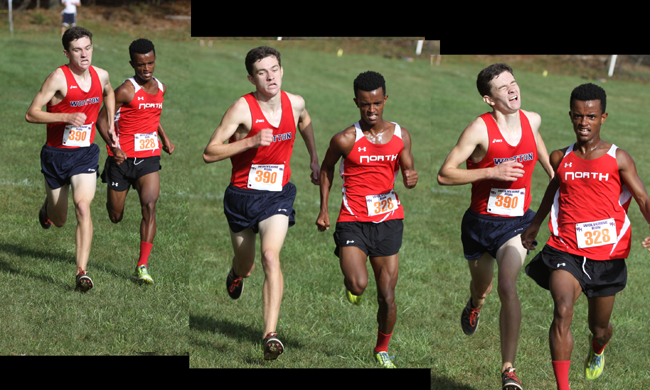 Wootton's displacers (sixth and seventh runners) did their job by finishing ahead of Broadneck's #4 and 5 runners. 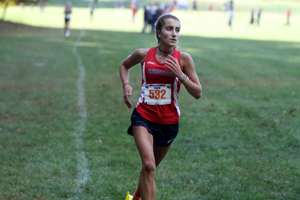 Wootton's #7 runner, Anna Baldwin, proved the old saying that a team is only as good as their seventh runner. Baldwin closed a 30 meter gap from 3.0 miles to the finish line to beat out Broadneck's #4 and 5 runners by just two seconds. That was the difference between Wootton winning the meet title. Wootton scored 37 and Broadneck scored 38. Said Redmond, "We're always striving for the top spots. I don't care if it's counties, regionals, states, or an invitational. We are trying to compete with the very best out there." She also added that she was very pleased with the way that her boys ran without three of the team's normal varsity runners. She believes the end of their season will be much stronger than the beginning. It was the third rendition of the Watkins Mill Wolverine Run Invitational and the meet continued to grow by leaps and bounds. It began as a weekday meet with just 76 finishers. It moved to Saturday last year and it had 318 finishers. This year, the meet almost doubled again with 575 finishers. It certainly got a boost with the 3A West and 4A West Region Meet moving to Watkins Mill, as evidenced by teams like Wootton and Richard Montgomery showing up, but maybe word is getting out that Watkins Mill is the most beautiful place to be on an October morning.